Duck Hunt is a light gun game that was released in 1984 in Japan and then a year later in America where it was one of 18 launch titles. It consists of three modes; the first one features only a single duck while mode B sees you facing two ducks at the same time. Using the NES Zapper accessory you have to shoot them before they disappear off screen. Each round consists of 10 ducks and you'll need to hit at least six to continue on. To stop wild gunslingers you only have three bullets for each set of ducks - if you miss three times they'll fly away and the annoying dog will pop up and taunt you! In higher rounds the action gets really tough as the ducks speed up and move more quickly from side-to-side; they'll also occasionally hide behind the tree making it harder to judge where to shoot. It's a shame there's nothing to break up the action though as it's just the same thing over and over again. Even the backgrounds don't change and it won't take long before you're bored of looking at the same thing. On a positive note, the arcade style sound effects work well and I enjoyed the short jingles that play when you start and finish a round. The final mode is Clay Shooting where two targets fly out at once - there's 10 sets in a round like the other two modes but the hit box is smaller and it's harder to shoot the targets as they disappear into the distance. Although it's similar to the other modes it's my least favourite as it doesn't have the personality that the others have with their quacking ducks and sniggering dog. 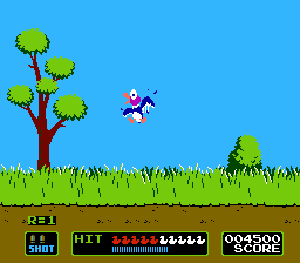 Duck Hunt is fun for a short while but it feels like more of a tech demo for the NES Zapper. While it did help to popularise the accessory on the NES it's just too basic and you're better off playing a more advanced light gun game like Freedom Force. Random trivia: The NES Zapper doesn't work on modern LCD and Plasma televisions due to the time it takes for them to interpret the light flashes on screen. The only way to play games like Duck Hunt is on an old CRT television - just don't cheat and put the gun on the actual screen!